I fully support the concept of a carbon tax and strong rules on fracking. However, as a resident of NYC, natural gas is the only economic alternative at this time to the use of fuel oil for building heat and hot water. Moreover, in addition to reducing CO2 output, the use of natural gas drastically reduces PM 2.5, which studies have shown to be a major health issue in NYC. By switching to natural gas, our building is reducing its CO2 output by about 60 tons per year. By vilifying fracking, as opposed to advocating strict regulation, you are departing from you stated mission of reducing CO2 and are helping to discourage the use of natural gas in NYC. 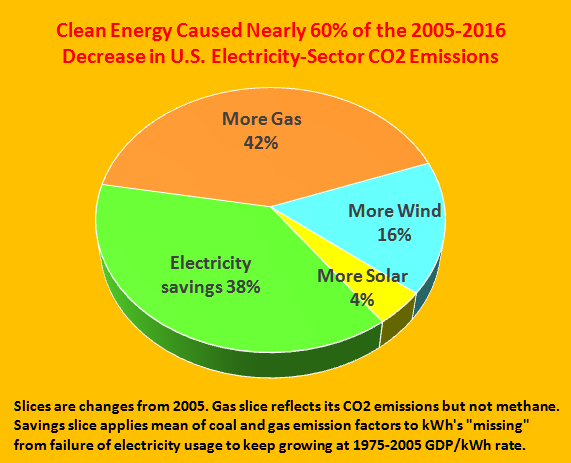 Moreover, anyone can see that the major gains to “clean energy” in your report are due to energy savings, not to wind or solar. Although this is in your tables, you fail to give it the proper emphasis in the text of your report, and your claim that energy savings is part of “clean electricity” is clearly questionable. Electricity saved is not produced, although it certainly reduces CO2 output. 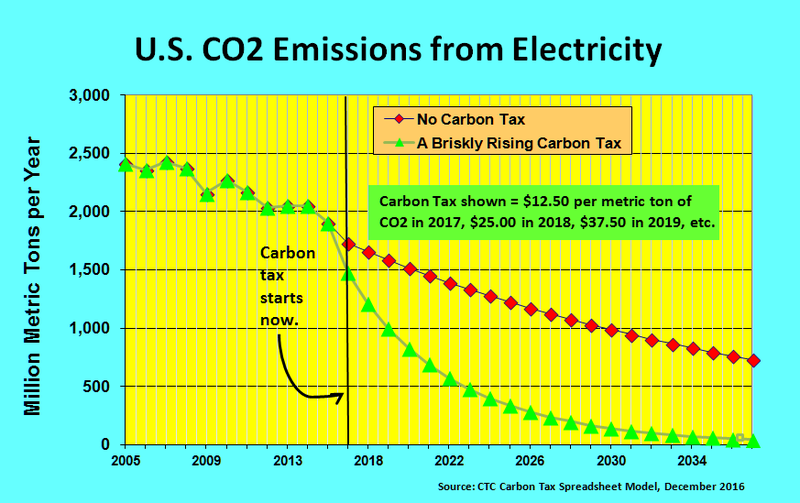 I firmly believe that a carbon tax is a potentially useful tool in reducing CO2. However, oversimplified and misleading reporting are not going to help pass legislation in what is becoming an even more hostile political environment. Homer, we’re glad you commented and that you support carbon taxes. You’re correct of course that the major part of the “clean energy” or “clean electricity” gains in our report are due to electricity savings. It’s surprising that you don’t believe those savings, most of which are attributable to energy efficiency, deserve to be classified as clean energy. That false distinction was called out for criticism in the seventies and is, by now, anachronistic. After all, why should an electric clothes dryer powered by solar PV be considered clean whereas drying clothes on a clothesline (also “solar” though not PV) is not? Or, for that matter (and more heretically), wearing clothes more times between washings? I’m surprised you think my report or CTC generally vilify fracking. We generally strive for technology-neutrality, so long as the social and environmental costs of each are reflected in their prices. What have we said specifically that leads you to think we vilify fracking? It’s incontrovertible that replacement of fuel oil by gas in generating electricity and steam and in on-site building heat and hot water has been an important contributor to NYC’s improved air quality. But so too was the earlier replacement of high-sulfur oil by low- and then ultra-low-sulfur oil. In any event, improving buildings’ energy efficiency (through enhanced HVAC, tighter building envelopes, etc.) obviously works in conjunction with cleaner fuels to reduce emissions. I am an electrician, in Texas. We need a transition away from burning precious renewable resources. We all learn this in school, but greed is a mighty help in forgetting the real needs. Franking is not the answer. Since Texas has started franking, we have seen a steady earthquake rise in the Dfw area and Oklahoma. They have put the sludge left over from draining each and every spot they find back in the space where the natural gas resides. This causes expansion where it shouldn’t. Fracking will cause Yellow stone to blow. Yes, our county sits atop a giant, for lack of a better term, pimple on the planets surface. And we all know if you put too much pressure on a pimple it pops on it’s own. This country would not survive the blast. Dams are not a full means of sustainability either. They cut off natural flow ways for sediment to pass the way it naturally has since this planet exploded into being. It’s already been proven at the hover dam. If you travel down to the very end of the river past the dam there are plain signs of this effect. Other tribes in smaller countries now have to buy water bottles because over the past 2 decades the damming has caused contamination. We have known about our poor usages of resources since the 30s. In the 50s there was a push for solar, but that got squashed by the government, just as our needs as a whole are about with this one. It doesn’t take nearly as much to create electricity as people think. If we could better educate the populous with FACTUAL information and not paid for information, we may have a chance. But, if our species is bent on overpopulation then we have to make a difference now. Tesla tried in the Victorian error to get better forms electricity. Now, hopefully Elon Musk and his company can kick start the growth.